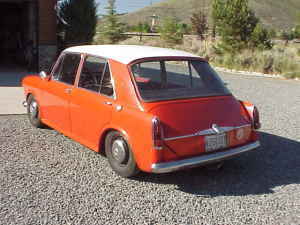 Besides appearing to be in remarkable condition, this car is very inexpensive at just $1500.00. If the car is all the seller says it is, for less than $2000.00 you could have classic car with a bit of a pedigree that you could bring to a car show next weekend. Located in Washoe Valley, NV, click here to see the Craigslist ad. Click here so see an earlier post about the MG 1100. 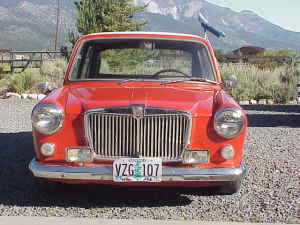 The MG/Austin/Riley/Morris (did I miss one out?) 1100/1300 have never commanded serious money in the UK or the US. Odd that the less practical (but more fun) Mini of the same vintage would cost ten times that amount. These are bargains and at that price the guy is giving away his, seems too good to be true. Excellent car for just running around the town, Highway driving however, you'd have to have balls of steel. These cars were never suited or even capable of the US highway driving conditions. Also, I am sure all the other JaCG readers are thinking the same thing, how did the Pug purchase go? Did you check it out?? Wollsely did an ADO 16 as well. This MG clearly has deflated Hydolastic system.....I saw leaky pipes 30 years ago when I serviced these cars. Had the pump then as well. I know someone who still has the factory's refill setup, and it works too!